One of the most popular tourist regions in India, Rajasthan requires you to make several visits to be able to explore it fully. Or, you could just walk into Chokhi Dhani, its most attractive gem other than the historical places in Jaipur. Spread over 10-acres of land on Tonk Road, this is one of the oldest resorts in the city that give you a taste of the life in Rajasthan. In fact, the name ‘Chokhi Dhani’ itself means ‘a special village’. And, with traditional mud huts with painted walls, rows of entertainers playing typical Rajasthani musical instruments, the graceful dancers and ethnic food, you get an instant feel of what life is like in a traditional Rajasthani village. A meal in a Rajasthani home is a matter of pride, especially when guests are over. 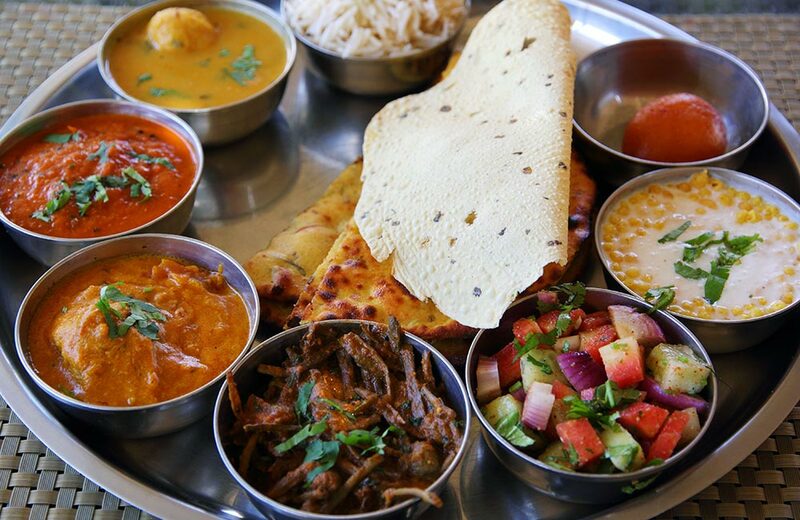 And, food is one of the biggest reasons to visit Chokhi Dhani, Jaipur’s own version of gastronomic Eden. There are eight dining options available at this beautiful resort, each with its own specialty. Choose from – the al fresco Kesar Kyari Barbecue for its grilled delicacies, the regal Aragosta Restaurant for its grand interiors and plush ambiance as well as its refined meals, the rustic Bindola Restaurant for its robust dishes and the folksy feel, complete with Rajasthani Mandana wall paintings or the very traditional Chaupal for its lavish multi-course meals and charmingly insistent servers, who will serve you more food than you could possibly eat. A meal at Chokhi Dhani is an experience in itself, and often people come here just for the food more than anything else. If you see a few traditionally dressed gentlemen at the Chokhi Dhani grounds, seemingly going at each other’s throats or scrambling in the grass, don’t call the police. They’re not fighting; simply re-enacting the epic Battle of Haldighati of 1576, where an army of just 20000 Rajputs fought gloriously against a Mughal horde of 80000. 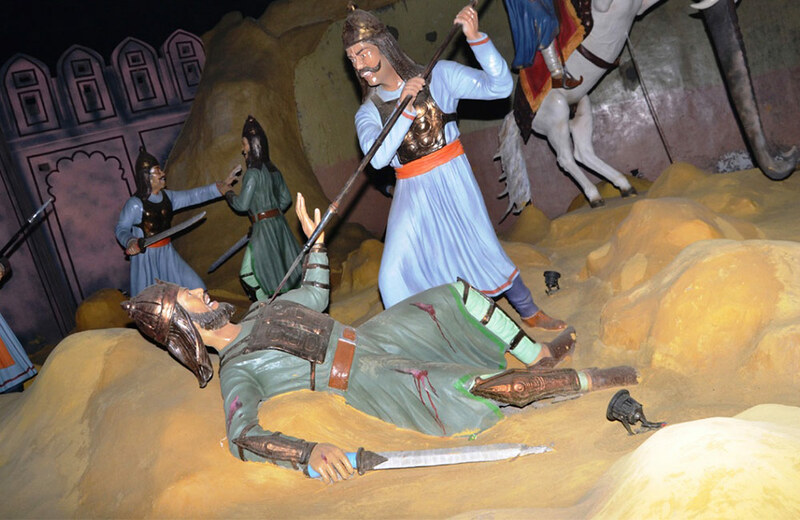 An interesting watch, the re-enactment also includes storytelling through murals and sculptures that depict the tales associated with the battle – the support of Bhamashah, Maharana Pratap’s loyal general, the legend of ‘ghaas ki roti’, the Jauhar Kund and more. The re-enactment of the Battle of Haldighati is unique to Chokhi Dhani, making it one of the top places to visit in Jaipur. Rajasthan is as famous for its flamboyant dances as it is for its food and architecture, and, you get to see the most popular dance forms here. 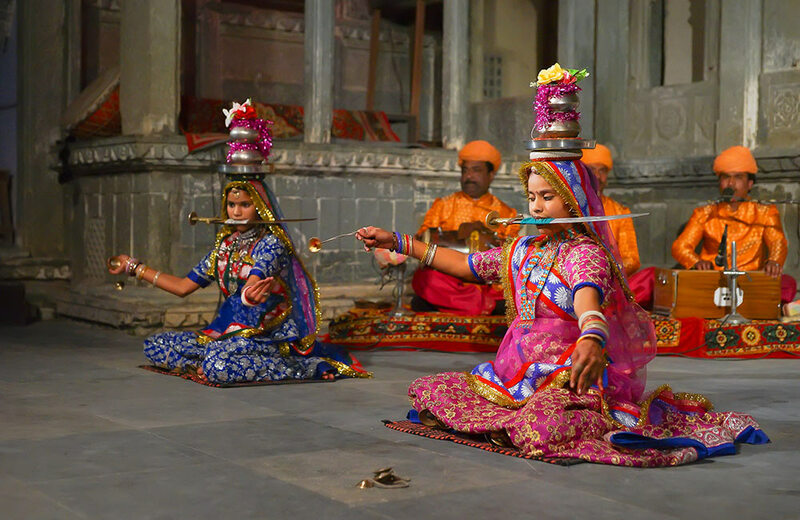 Seeing the resplendent Ghoomar, the intriguing and mesmerizing Kalbeliya and the Terah-Taali Manjira dances are one of the top reasons to visit Chokhi Dhani for tourists and locals alike. Other dance performances to watch at Chokhi Dhani are Bhopa-Bhopi and the Chari dance by the Bhavai folk artists. With umpteen options for shopping at Chokhi Dhani, Jaipur firmly claims its place is one of the most unique retail Meccas in the country. Kala Gram is the shopping hub of the resort where you will find everything from beautiful Rajasthani textiles, jewelry and accessories to home décor accents and paintings. 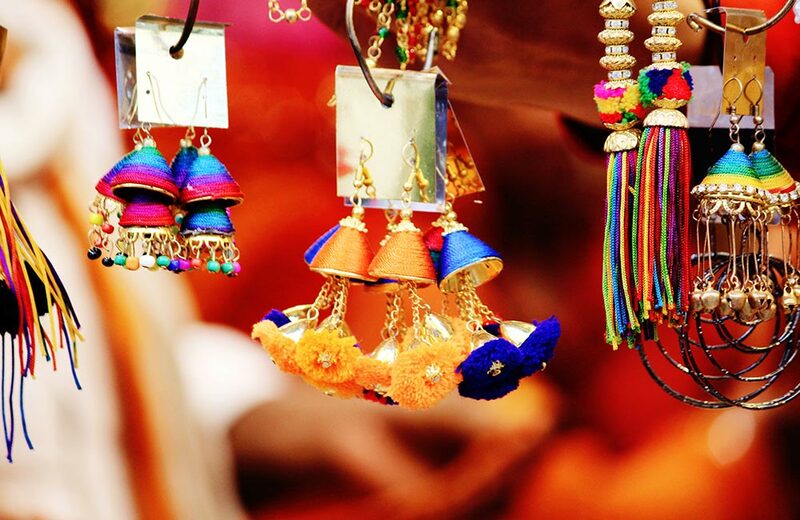 Rajasthan is a craft-rich state, and its various crafts are well represented here, making shopping one of the biggest reasons to visit Chokhi Dhani. 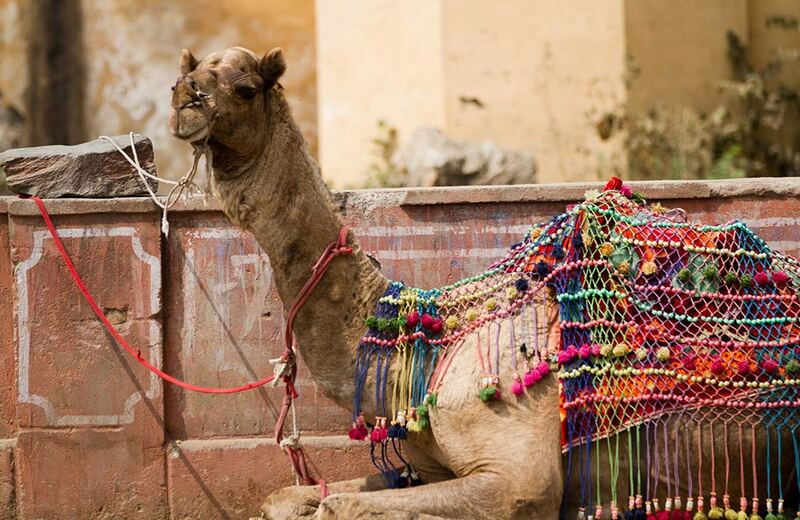 Here’s something fun for both kids and grown-ups…camel rides! If you have kids, these rides are one of the best reasons to visit Chokhi Dhani. You could use this opportunity to teach your kids the characteristics of the camel, why is it only found in the desert and so on. Chokhi Dhani is a magical place for kids. Really, we kid you not! With constantly running mini-shows like the puppet show, a magic show and all the dances, Chokhi Dhani ensures your kids will stay busy for hours. For grown-ups too, there are several attractions – Nat no Kartab (traditional acrobatics), the bird fortune teller and a bioscope that works well for ages 2 – 18, and 18 and above. 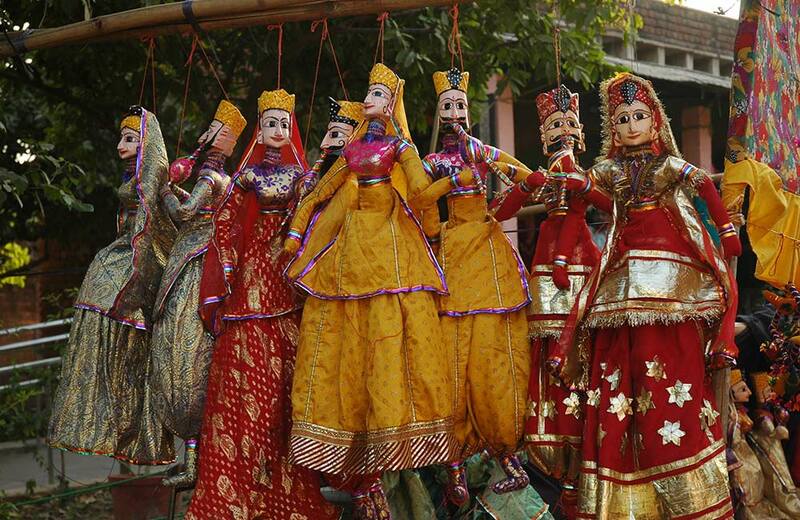 The variety of shows is perhaps one of the strongest reasons to visit Chokhi Dhani. A mehendi artist sits close to Kalagram, carnival-like games abound and excitement is palpable in the crowds. The timings of Chokhi Dhani are from 5:00 pm to 11:00 pm, making a visit to here one of the best things to do in Jaipur in the evening. Chokhi Dhani is situated on Tonk Road, which is a stretch of National Highway 52 in the southern part of the city, just beyond Sitapura Industrial Area. Jaipur International Airport is around 11.5 km, while Jaipur Railway Station is 18.8 km from the ethnic resort. You can easily take a bus or taxi from both these transit hubs to reach Chokhi Dhani. A visit to Chokhi Dhani is a memorable one with all these activities and more in the offing for you…make the most of it! Who knows?! You might just get more reasons to visit Chokhi Dhani on your next trip to Jaipur.